Don’t be surprised if more men start considering Botox injections in the near future. Only it’s not going to be for fighting age lines and wrinkles. New research suggests that this toxin could combat the effects of prostate cancer or enlarged prostates. Scientists report that Botox causes tumor cells in the prostate gland to shrivel. This treatment was tested on male patients with localized prostate cancer (cancer cells are contained within the prostate gland) in a clinical trial at Texas University. In order to test its effectiveness, half of the gland was injected with Botox and the other half with saline. 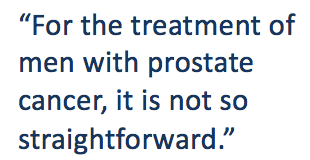 Each patient in this trial was scheduled to have their prostate removed via radical prostatectomy at a later date. Cancer cells were compared following the procedure to measure the effects of Botox. Preliminary results showed that the Botox injection had significantly shrivelled its half of the tumor, while the saline did not. Scientists argue that the toxin could impact other forms of cancer similarly. Botox injections also show real potential for treating enlarged prostate (benign prostatic hyperplasia). A majority of men over the age of 60 suffer from the symptoms of this age-related medical condition. Research from the University of Pittsburgh has shown that Botox subdued prostate symptoms in 75 percent of male patients. Older men can find year-long relief from an enlarged prostate through a single injection that only takes minutes. This almost seems too good to be true, but the results can speak for themselves. An injection appears to work by calming the muscles and nerves of the prostate. This reduces the amount of pressure applied on the patient’s urethra and lets them urinate without difficulty. The professor theorizes that the toxin may limit the specific nerve elements that the tumor needs to survive. Only time and further research will tell. In any case, the effectiveness of this approach will continue to be tested and compared against the results of current prostate cancer treatments.